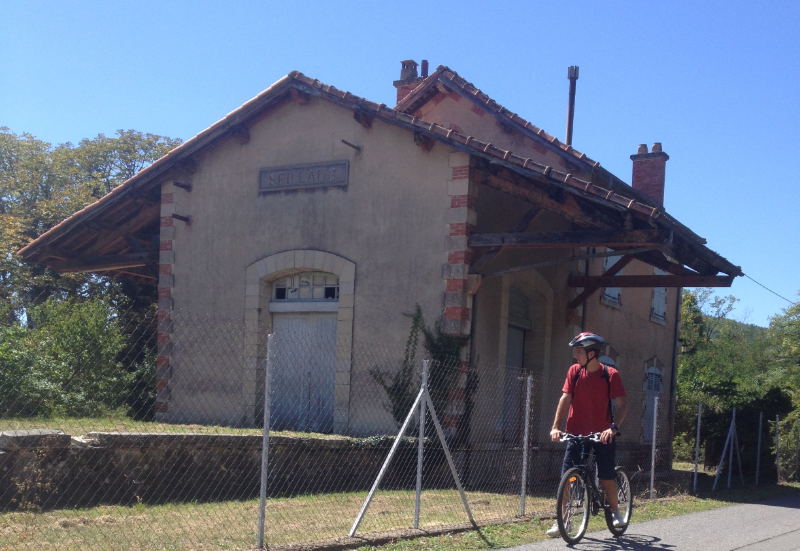 We set off from La Gare de Seillans heading West towards Draguignan. 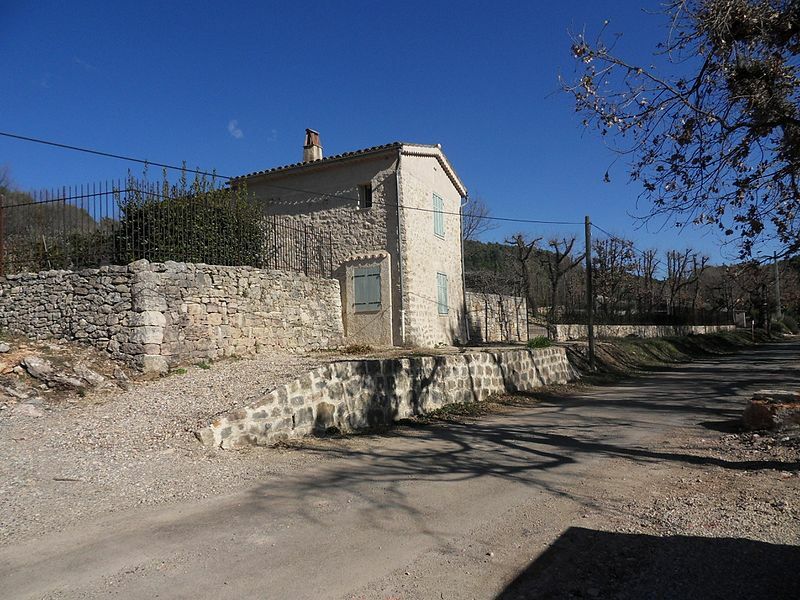 If we are used to weather in the UK, we are still surprised by just how blue the sky can be in Provence, and just how warm the sun can be. It covers a very short length of the line which was explored on foot. The route turns quickly to the South as can be seen in the map below. 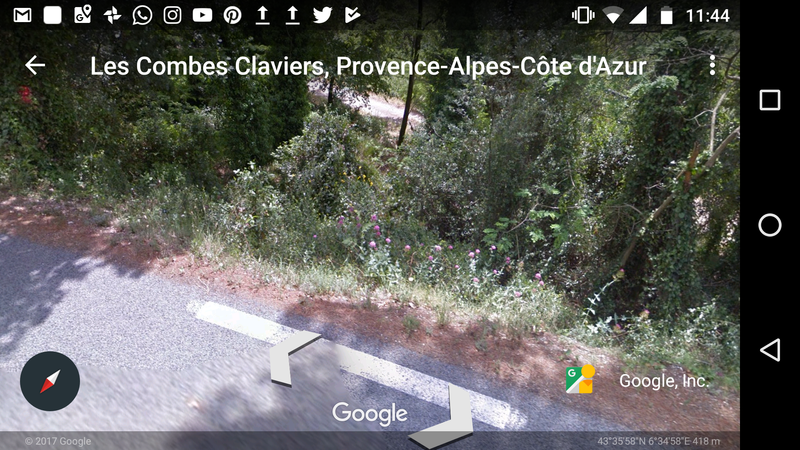 The formation is visible in the satellite images on Google Earth after crossing the D19. 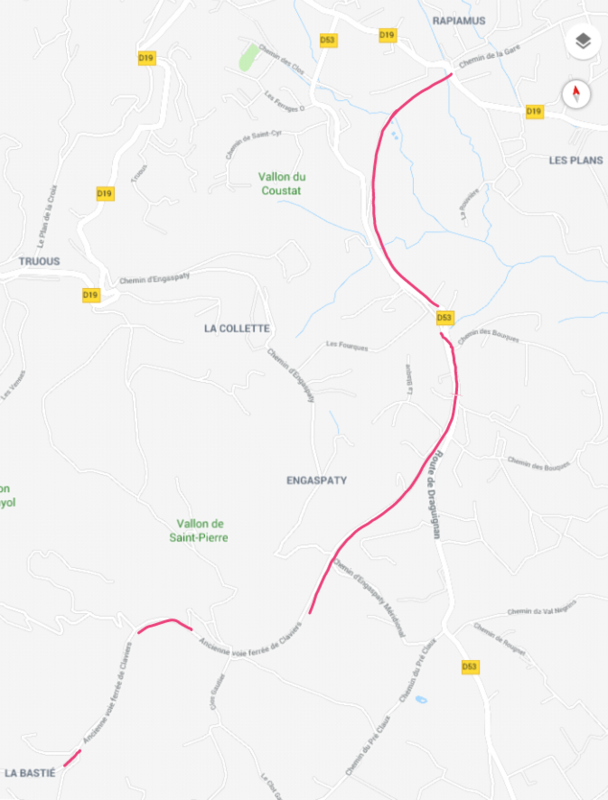 The route curves round to join the present D53 and in a short while leaves it on what is now called the Ancienne Voie Ferree de Claviers. 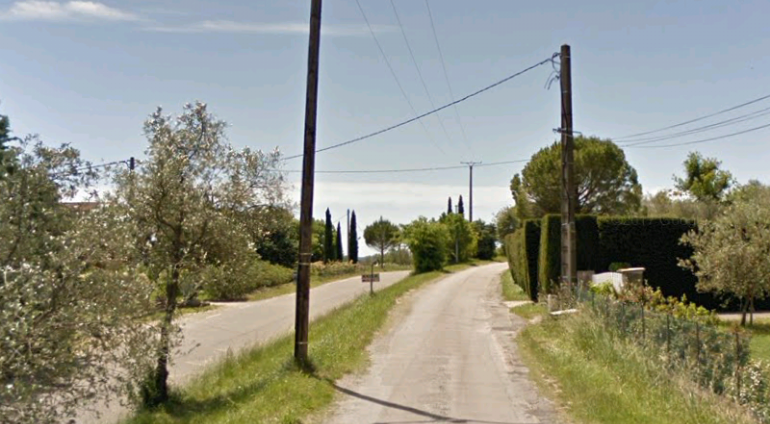 For some way it travels alongside the D53 Route de Draguignan before branching off to the right to follow a more Southwesterly line. 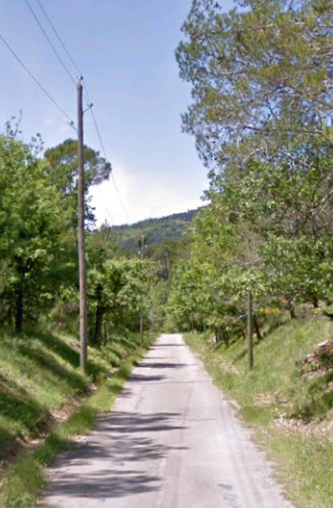 The road is otherwise known as Le Petelins. 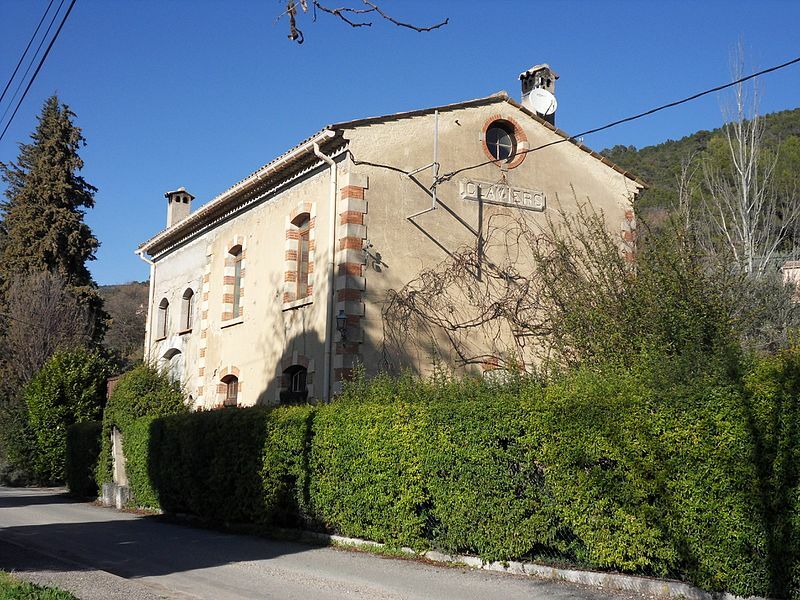 One of the most enjoyable things about parts of the route of the Ligne de Central Var is that it is possible to follow them in a car. We did this over as much of the length of the route as we could in November 2017. 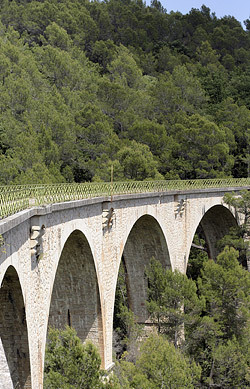 Encountering the Viaduct du Rayol (43 ° 36 ’53 “N, 6 ° 38′ 19” E) was one of the special moments on that journey. 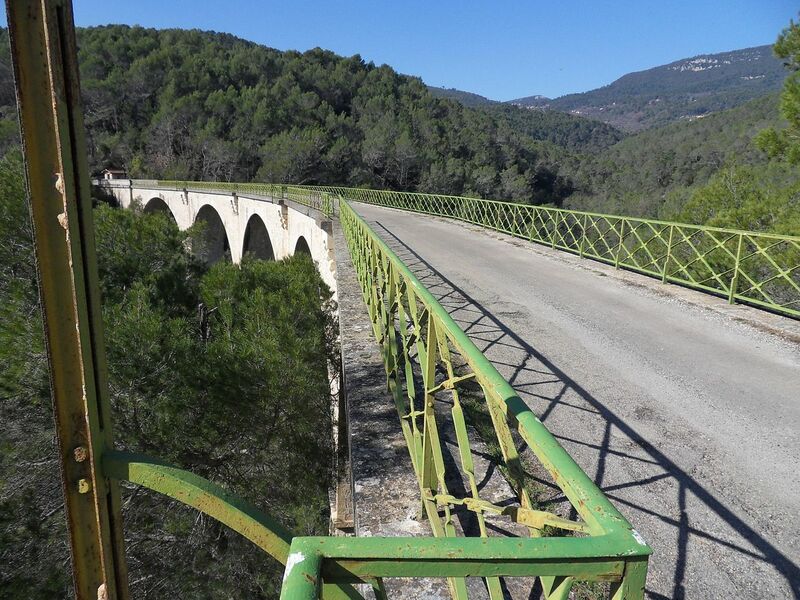 The Viaduct is topped by lime green railings which seems to set it off beautifully. It is 159 metres long. 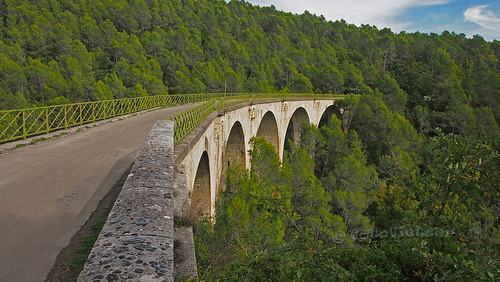 When the line was operational it was not easy to access this viaduct except by train which perhaps explains the difficulty I have had in finding old postcard views of the structure. 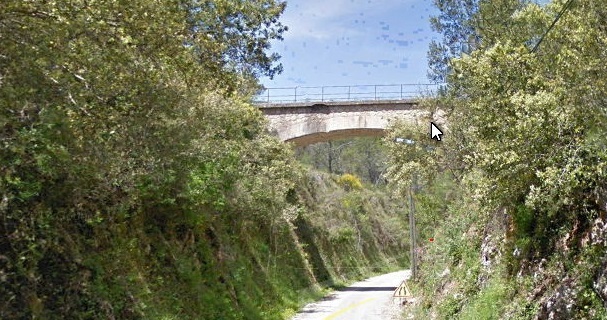 Beyond the viaduct, the line continued on through the forest to La Bastié and Les Clots de Meaulx, where there was a small Halt which can be seen in the first two pictures after the map below. 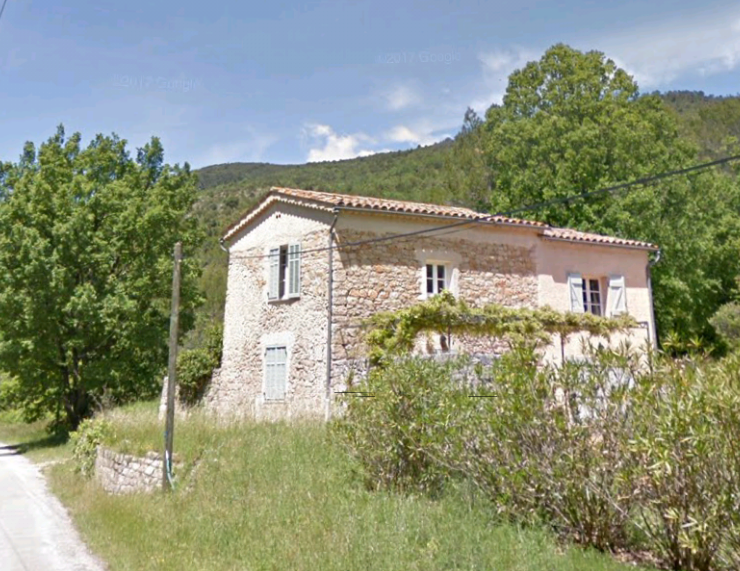 And then on towards a crossing of the D55 at the point where its name changes from La Plaine de la Serillere to La Cougnasse. After the road crossing tarmac gives way to the basic railway formation. 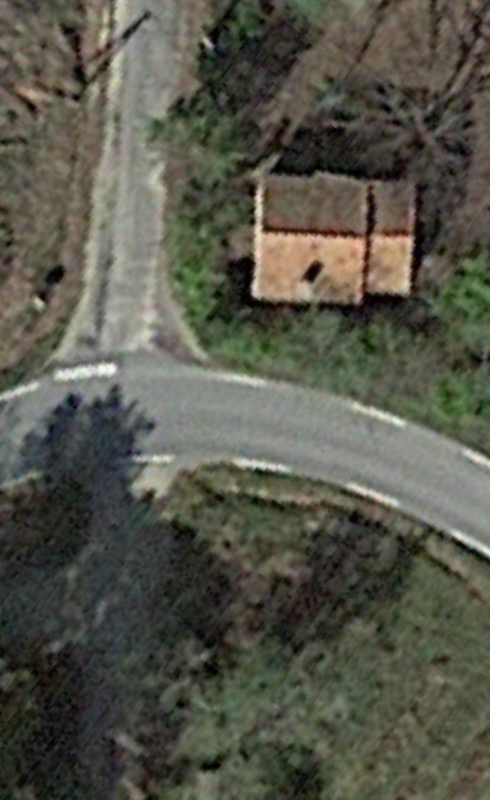 There was a crossing keepers cottage here which is now well hidden by hedging but which can be seen in the satellite view below. 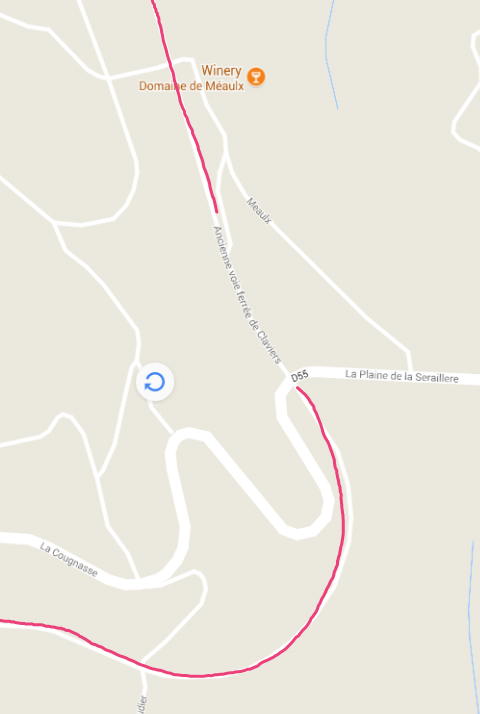 The line took a tight curve from travelling in a South-Southeast direction to a Westerly direction travelling South of the D55 (this can be seen on the map below) which went through a series of hairpin bends immediately adjacent to the road/rail crossing. 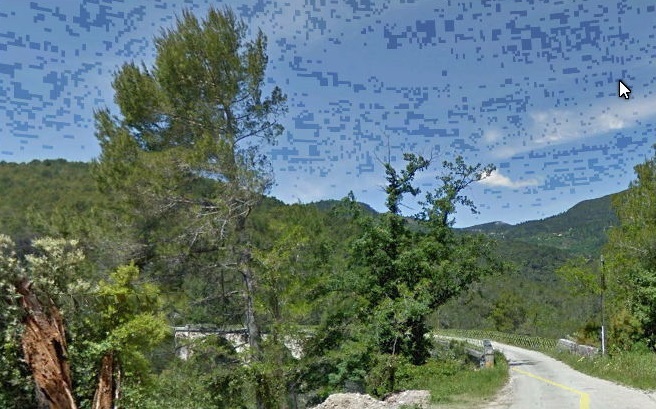 The line continued towards Draguignan and entered the Tunnel Font du Roure which appears on the map below. 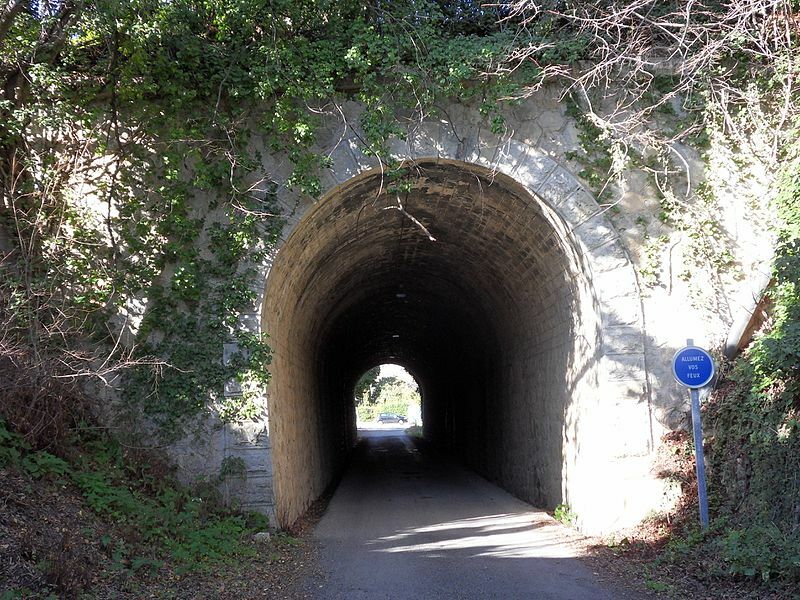 I could find no photographs of the tunnel portals and neither is accessible by vehicle. 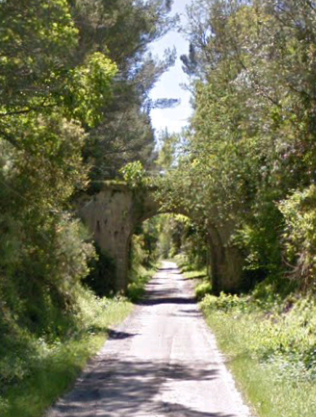 Beyond the tunnel the line passed to the North side of Les Giniestieres running adjacent to the D55 on its South side for the run into Calviers, returning to a tarmac formation along this route. 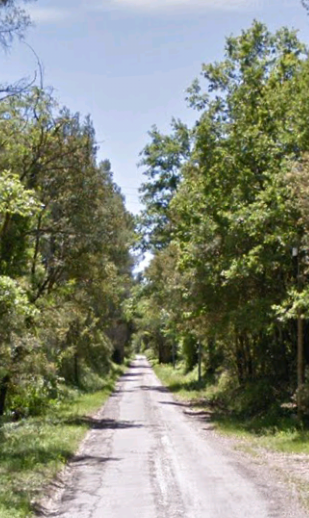 The track bed can just be picked out between the trees on the South side of the D55. 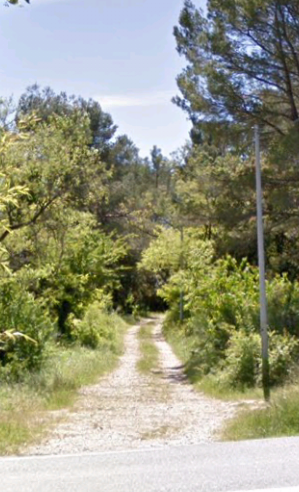 Google Street view comes to the rescue as we passed this point too quickly in the car to pick out the alignment of the railway on the ground on November 2017. 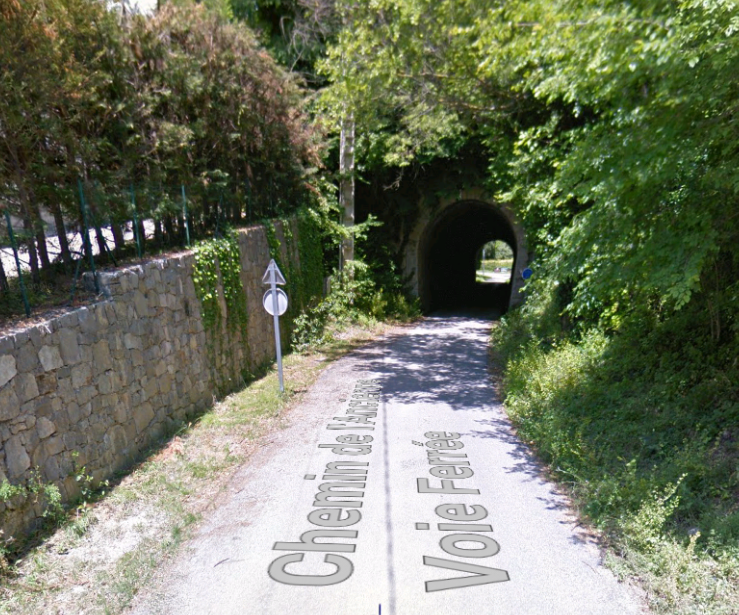 The village of Claviers sits over the line and it passes under the village in tunnel. 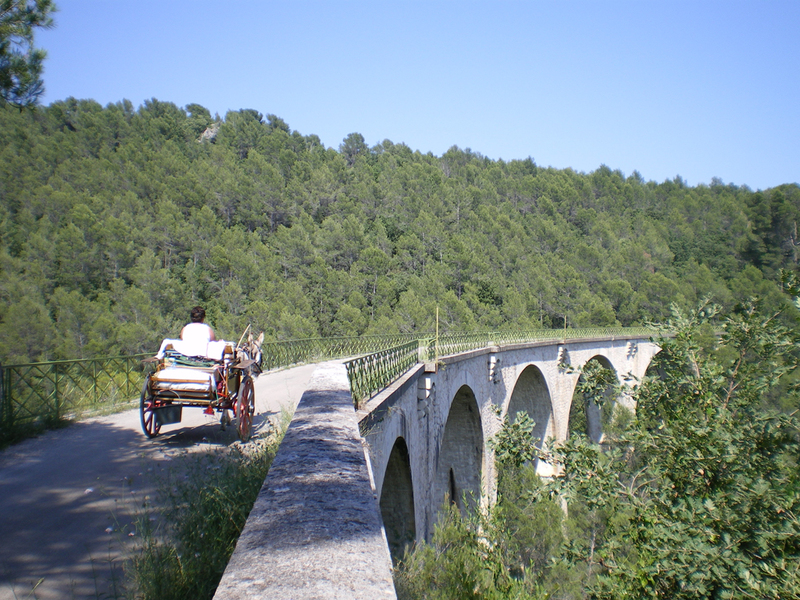 The Tunnel de Claviers is still in use as a road tunnel, it is just 51 metres long. The portal at the South East end is above and the North West portal below. 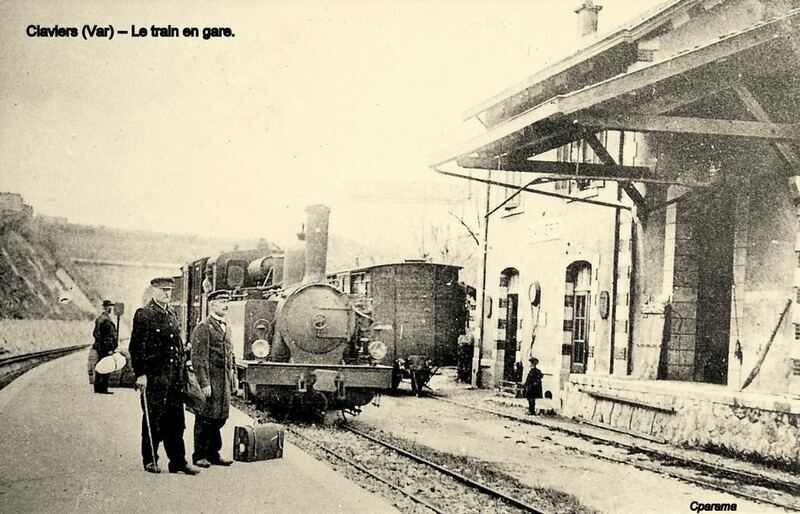 Immediately beyond the tunnel the line entered Claviers Station. Here we rest a while as we have completed the 8th section of out journey. 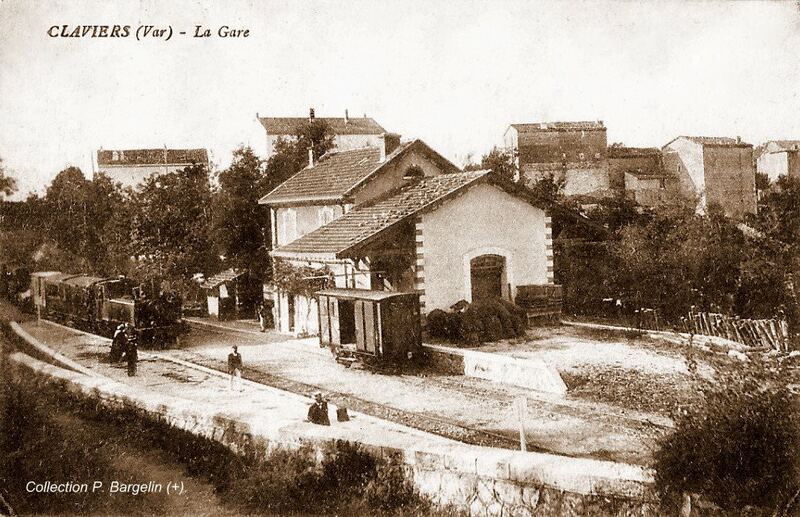 This entry was posted in Railways and Tramways Around Nice, Railways Blog on December 4, 2017 by rogerfarnworth.